Adaptive reuse is hands down our favorite approach to office architecture. 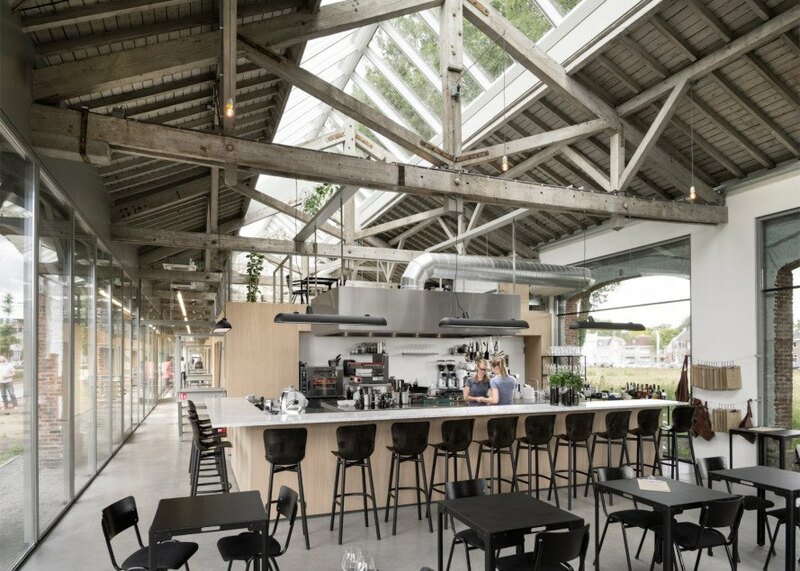 Dutch design studio Bedaux de Brouwer completed one such example in Tilburg, where they converted an old train station into a beautiful office and restaurant. Much of the original architecture was left intact, including the tall ceilings and brickwork, to give the renovated building an industrial chic vibe. 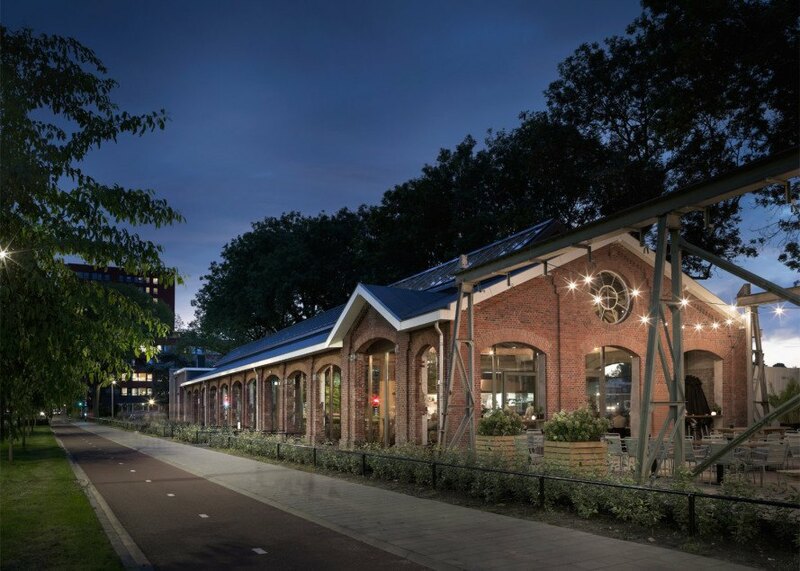 Located within the city’s post-industrial Spoorzone site, the renovated train shed originally served as a timber warehouse that was later largely bricked up when it was used as a workshop. When Bedaux de Brouwer began renovations, they removed the bricks to reopen the archways and installed glazing. The architects also created a long skylight along the top of the roof; both changes flood the building with natural light. The transparency also helps create a sense of community with the neighborhood by allowing office workers to look out onto the adjacent pedestrian and bicycle paths (presumably converted from train tracks), and vice versa. The interior is kept minimalist with exposed metal and timber trusses, polished concrete floors, and a muted color palette. Rather than set up walls, the architects divided the space with a custom oak-clad structure flanked on one end by bleacher-style seating. The structures conceal private offices, toilets, and storage areas. Personal workstations and conference tables are located atop the structure. The opposite end of the structure is used as the bar for a restaurant called The Houtloods (Dutch for timber yard). Located within the city’s post-industrial Spoorzone site, the renovated train shed originally served as a timber warehouse. When Bedaux de Brouwer began renovations, they removed the bricks to reopen the archways and installed glazing. The architects also created a long skylight along the top of the roof; both changes flood the building with natural light. The transparency also helps create a sense of community with the neighborhood by allowing office workers to look out onto the adjacent pedestrian and bicycle paths (presumably converted from train tracks), and vice versa. The interior is kept minimalist with exposed metal and timber trusses, polished concrete floors, and a muted color palette. Rather than set up walls, the architects divided the space with a custom oak-clad structure flanked on one end by bleacher-style seating. The opposite end of the structure is used as the bar for a restaurant called The Houtloods (Dutch for timber yard).